White light interferometry works much like laser interferometry, except that many wavelengths of light are used. This allows for multiple data points from the same area on the sample, and for color data to be extracted from the sample. 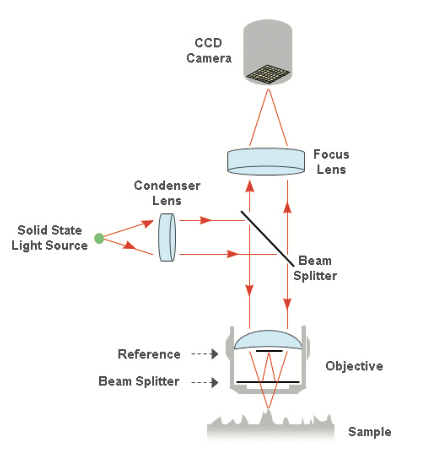 Schematic of the white light interferometry (WLI) technology. In white light interferometry, an individual wavelength’s diffraction pattern is analyzed much like a laser interferometer, but in combination with many other wavelengths to increase sensitivity. This technique has been greatly enabled by color cameras that automatically break the light down into red, blue and green signals. However, the optics involved are much more complex than a standard laser interferometer and the software reconstruction is also complex. 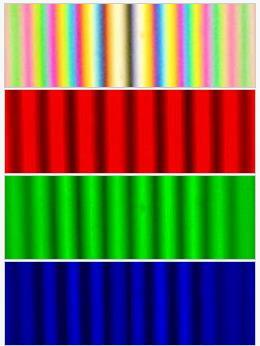 The Color Signals in White Light Interferometry. Laser interferometry could be seen as just using the red piece of the spectrum out of this white light interferogram. By adding in other frequencies of light much more information is available and can be taken advantage of using modern computing. This method does require significant computing power and various computational models, which can lead to constraints on surface geometry/opacity and modeling artifacts.